How Does Bail Work in Iowa? Understanding how bail works in Iowa can help you or a loved one be prepared so that you can ensure a speedy release after arrest. Bail is the amount of money you must pay to be released from jail while your case is pending. By posting bail, you are agreeing to appear in court on your assigned court dates. It is a guarantee, which money can be forfeited if the Defendant fails to show up to court on assigned dates. How does the severity of the crime affect bail? The bail amount is directly linked to the severity of the crime. It is related to an assessment of your potential danger to the community and the risk of flight. Hence, the less severe the crime, the less criminal history, the greater the ties to the community – housing, length of time present in the jurisdiction, employment, family, etc., the better chance that your bail will be relatively low or you may be released on your own recognizance. The exact bail amount may initially be set by the warrant or the sheriff in the county the arrest took place. Usually, when you see the judge in court in the morning at your initial appearance, the judge will set your bail, which may be the same or more or less than what the warrant or sheriff set it. Sometimes there is no bail amount until you first see the judge, which means you will remain in custody until then. If you or someone on your behalf can pay the entirety of the bail in cash, you do not have to involve a bail bondsman. The money is paid either to the sheriff if there has been no court appearance or the clerk of court after the first court appearance. As long as you show up to all of your court dates, once the case is over you or whoever posted the bail will receive the total amount of bail back, in full, typically via check mailed to you or whoever posted bail, within one month of the case disposition. There is an option for the person posting bail to allow the court to apply the bail money towards any fines, penalties, or costs. They simply would check the box authorizing that, if that is what you or they want. Any remainder would be mailed back. Sometimes judges make bail “cash only,” which means you must put up the bail in full in cash, and cannot use a bail bondsman. If you cannot afford to post bond using cash in full, you often can opt for a surety bond. To get a surety bond, you or someone close to you must contact a bail bonding company/bail bondsman. You pay the bonding company approximately 10% of the total bail, and the bonding company covers the rest of the bond with the court. Even if you appear in court for all of your court dates, the bail bondsman keeps the 10% you paid, or whatever fee amount agreed upon. Hence, that costs more money in the end. But it may be necessary for a large bail amount which you cannot pay in full up front. More often than not, when a Defendant sees a judge in the morning at the Initial Appearance, the judge simply will release the Defendant on his or her own recognizance. If you are released on your own recognizance, you are not required to pay any bail, but must promise that you will show up to all of your required court dates. This generally is used for relatively minor charges or for individuals with a clean history and sufficient ties to the community, etc. What do I do after I post bail? Once you, a family member, or friend posts bail, you should be released within a couple hours. After you have been released, contact a criminal defense attorney to represent you. Want to learn more about working with a criminal defense lawyer for your case or the case of a loved one? 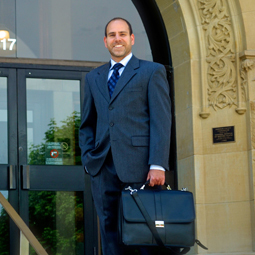 Request a free consultation with Adam Pollack.